Reception hours are from 08h00 to 18h00. Any arrivals after 18h00 needs to be confirmed with reception or management so that a De Tijger Lodge staff member is on standby for the late arrival. Agent commission will be added to these rates if not booked direct. 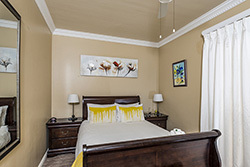 The Lion Room has a en-suite bathroom with shower, bath tub, single basin and toilet. 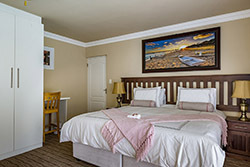 The Room has a sliding door leading out to the picturesque pool area where you are welcome to swim or lounge around with your favourite refreshment. 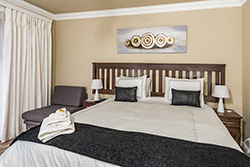 All bedrooms are decorated to an extremely high standard offering 100% Egyptian cotton linen (400 thread count) and include all the necessary facilities, bar fridges as well as a full DSTV Bouquet and all rooms have air conditioners. 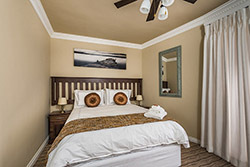 The Giraffe Room has a full en-suite bathroom and a small kitchenette. The Room has a sliding door leading out to the picturesque pool area where you are welcome to swim or lounge around with your favourite refreshment. The Tiger Room has an en-suite bathroom with shower, single basin and toilet. The Room has a sliding door leading out to a smoking courtyard area. The Buffalo Room has an en-suite bathroom with shower, single basin and toilet.